Matthew Bray is a well known artist in the Medway area. 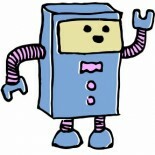 He kindly spoke to Creatabot to tell us a little more about himself and his background. Creatabot speaks to Kirstin Moore, a jewellery designer based in Kent, and found out some more about her background and what inspires her. Victoria Wainwright is an all round creative in Kent that specialises in illustration. I asked her some questions so we could find out a little more about her.